Tok, Alaska is a town of 1,414 that sits next to the Alaska Highway about 150 km (93 mi) from the Canadian border. It is situated at the junction of the Alaska Highway and the Glenn Highway, and is a popular stop for travelers continuing north to Fairbanks, or turning south towards Palmer and Anchorage. About 20 km (12.5 mi) east of Tok is the Tetlin Junction, where you can choose to turn north on the Taylor Highway to reach Eagle, Alaska. 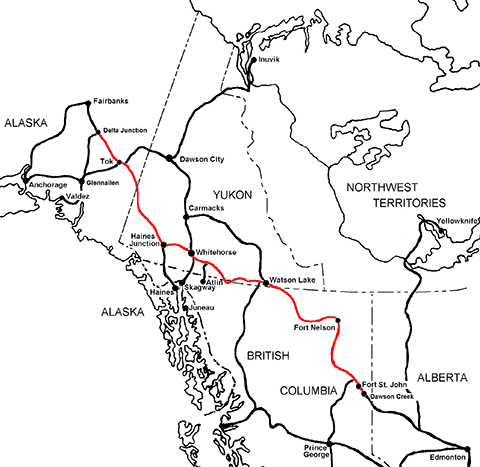 Tok was established during the construction of the Alaska Highway and the Glenn Highway in the early 1940s. It has been historically and continues to be a trade centre for the Athabascan villages of Northway, Tetlin, Tanacross, Mentasta, Eagle, and Dot Lake. Tok’s location between the Alaska Mountain Range and the Mentasta Mountains make it a truly stunning location, with dramatic landscapes and an abundance of wildlife.